Brick walls are attractive and durable when designed correctly and built with appropriate materials in a technically competent way. This guidance note produced by the Brick Development Association is aimed at all those in the delivery chain to help them achieve long lasting results when considering external works such as freestanding garden and retaining walls and chimneys which should always be considered as very severely exposed to frost attack regardless of geographic location. Whilst consideration of geographical exposure is important when designing the walls of buildings it is recommended that all external works be classified as severely exposed to the risk of frost attack and be designed and built accordingly. Paving applications are not covered in this note as BS EN 771-1 bricks are not intended for these uses. Clay pavers to EN 1344 are available. This BDA guidance has been produced to bring together information issued in separate documents in the past with members’ recent experience. There is some evidence to suggest changing climatic conditions over the last few winters i.e. wetter spells preceding severe overnight temperature falls, and this note takes account of this. 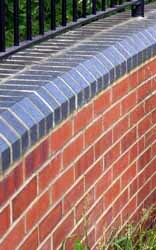 Ketley's Class A bricks are the highest performing class of brick available in the UK and they are excellent for use in a rigid DPC. Repairing damage caused by dampness is invariably expensive and often disruptive to occupants of a building so its imperative to get the damp proofing right.